SPOILERS FOR FEED AND DEADLINE!!! Now, the year is 2041, and the investigation that began with the election of President Ryman is much bigger than anyone had assumed. With too much left to do and not much time left to do it in, the surviving staff of After the End Times must face mad scientists, zombie bears, rogue government agencies-and if there's one thing they know is true in post-zombie America, it's this: Things can always get worse. SPOILERS FOR FEED AND DEADLINE!!! Okay, you have been warned. Blackout begins fairly soon after Deadline. George (Georgia Mason) is locked up in a CDC building, while Shaun and the gang are hanging out with a mad scientist. George needs to figure out how to get away from the CDC and find Shaun. Meanwhile, Shaun is trying to figure out how to gather the necessary evidence to show the world that the CDC is not your friendly and helpful government agency. Will George find Shaun? Will Shaun save the world? Will zombies take over the world? Only time will....aaarghh! Blackout is definitely an explosive ending to the Newsflesh trilogy. In this final book (okay, a fourth book has been announced but I'm going to ignore that for now), we get to see how everything comes together. We finally understand the CDC's complete plan, how far their deviousness goes, and all of the secrets behind the zombies. We also get to learn a bit more about George and Shaun. 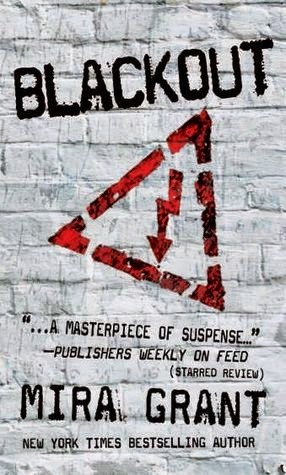 If I am being honest, I enjoyed Feed more than Blackout; however, Blackout is still an interesting novel. If you enjoyed Deadline, you will enjoy Blackout. As in the previous two books, Grant does a great job of balancing zombie scares with menacing humans and carefree moments. Because the zombie scares don't happen every three pages, the zombie scenes are a bit more terrifying. You never know when they are going to happen. I felt that there were just the right number of zombie scenes in this book. If you are an old school Romero movie fan, you will probably like the number of zombie scenes. If you are more of a "fast zombie" fan, there may not be enough zombie scares for you. The CDC plot line was quite clever, and it seemed fairly realistic (for a SF universe). How the zombie virus was behaving made sense to me, and my limited biology knowledge. I have read blog posts by Grant stating that she does a lot of research for her books, and I feel that it shows. There are a few things that don't completely jive for me (i.e., how any large animals have survived for this long in the wilderness), but overall science feels like science in this story, not like magic. My one big complaint with this tale is that some of the plot devices felt a bit convenient. George's plot line in particular felt a bit contrived at times. In particular, I found George's plot conflicts to be handled just a bit too easily. I appreciate that Grant was in a bit of a bind regarding how everything was going to work out for her protagonist, but I wish that George had to struggle a bit more. Of course, if this had happened, the book would have been much longer. Audio: I really enjoyed the audio book for Blackout. I am really happy that Christensen came back to narrate George's sections. The reading was clear and crisp. The tone, pacing, and inflection were all quite good. My only complaint is that Christensen reads George's chapters and Goldstrom reads Shaun's chapters, so both readers end up doing their own versions of the same characters (i.e., secondary characters) and their own versions of the other's character (i.e., Christensen reads Shaun's dialogue and Goldstrum reads George's dialogue). This doesn't happen too often, but it is a bit annoying and confusing. Although I found some parts of Blackout to be a bit convenient, I really enjoyed Blackout. I can see myself re-listening to this entire series. In fact, I might end up doing that when Rewind comes out.